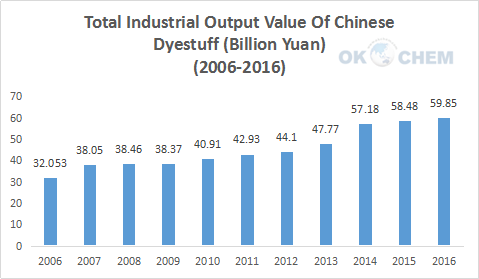 Based on data of Chinese Dyestuff Industry Association, Chinese dyestuff output presented a stable upward trend from 2006 to 2016, with the output increasing from 699,000 MT to 928,000 MT and the total industrial output value from 32.053 billion Yuan to 59.85 billion Yuan. 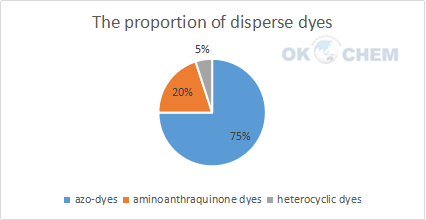 Disperse dyes production is the largest in all dyes. They have good leveling properties and good color fastness to sublimation, and can be used for dyeing man made cellulose ester and synthetic fibers specially acetate and polyesterfibers and sometimes nylon and acrylic fibers. China produced about 445,400 tons disperse dyes in 2016, accounting for 48% of the total production of the dyestuff. 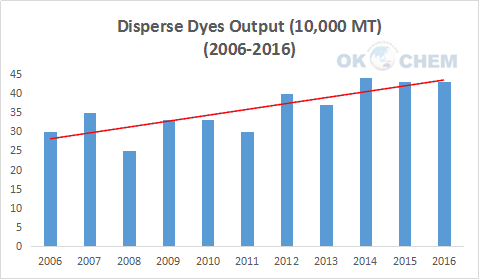 In general, disperse dyes output has been on the rise in recent ten years. The main disperse dyes in China are azo-dye, aminoanthraquinone dyes and heterocyclic dyes, with the market share at 75%, 20% and 5% respectively. 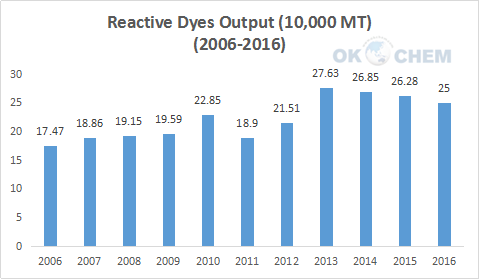 Reactive dyes output is the second biggest in Chinese dyes market. They are mainly used in the dyeing process of the plant fiber, animal fiber and regenerated cellulose fiber. Reactive dye is a water soluble dye. They have better wash and light fastness properties, better substantivity. According to the data, China produced about 250,000 tons in 2016, accounting for 26.94% of the total production. 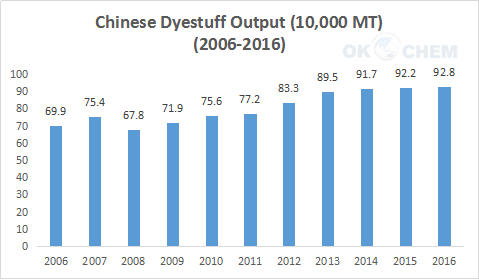 Now Chinese dyestuff output accounts for 70% of the global production, and has become the largest production and supply base in the world. 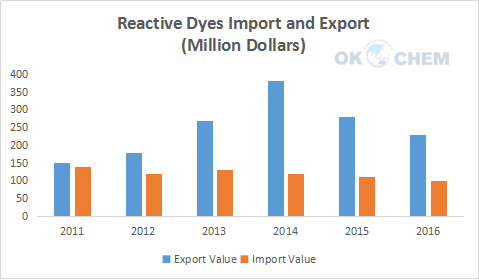 From 2011 to 2014, reactive dyes exports grew considerably, but declined after 2014 owing to the environmental policies. Besides, with the technology development of Chinese reactive dyes, the imports also decreased gradually.